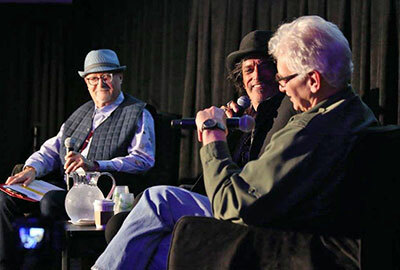 On Saturday afternoon at this year’s Winter NAMM Show, producer/engineer Jack Douglas and Joe Perry of Aerosmith will joined moderator Mr. Bonzai in an exploration of the inception and creation of a great album, the historic “Toys in the Attic.” Recorded at The Record Plant in New York City, it was released in 1975, won two Grammy Awards and sold over 32 million copies worldwide. Following the panel, Geoff Emerick presented to Jack Douglas the NAMM TEC Hall of Fame Award, and Johnny Depp presented to Joe Perry the Les Paul Award during the 32nd annual awards show, which featured a performance by Joe Perry, Johnny Depp, and Alice Cooper. Pictured (L-R) are Mr. Bonzai, Joe Perry and Jack Douglas. Photo Courtesy of NAMM.